Take a picture of yourself or others holding the paper survey sign and share with the What Women Want team to have your demand for quality reproductive and maternal healthcare counted as an official campaign submission. The Photo Survey Toolkit is available in 16 languages. 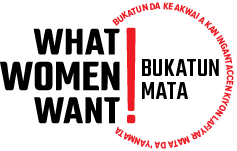 Each language download includes the What Women Want paper survey sign and other materials to help you share the survey with the women and girls in your community. Detailed submission instructions are below the toolkit downloads. Interested in translating the survey into another language? Please reach out to info@whatwomenwant.org for support.